I am an independent Stampin' Up! demonstrator in Melbourne Australia. Become a Stampin' Up demonstrator between now and August 15, 2008 and you will save $25 off the starter kit price. You will receive over $500 of product for just $299! HOW GOOD IS THAT?! Contact me to find out more! Click here to see the Stampin' Up website! I have a NEW catalogue!! I'm sooooooo excited! 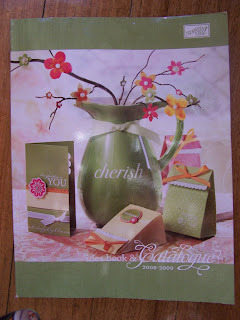 I finally received my complimentary copy of our BRAND NEW Stampin' Up catalogue for 2008/2009. It's got some fantastic new stamp sets and accessories. For the month of April, I will be offering FREE POSTAGE on every catalogue, which means you will only be paying $12.95 including postage for this wonderful Ideas Book and Catalogue. If you'd like a copy, please contact me and I'd be more than happy to send you one. Also, if you are interested in having a workshop, I'd love to help you out! 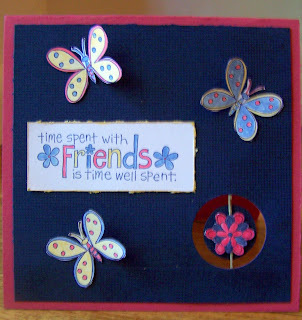 Workshops are fantastic times of fun, laughter and friendship as you learn new stamping techniques and ideas while you make cards together. They are also a great way to earn FREE Stampin' Up product! Contact me for more information!! Well, it's been a while since I've posted on here - life just seems to take over sometimes! I am planning on getting some cardmaking done on Monday (although I probably really should be doing uni work!!) so will have something to post on here then! In the meantime though, I thought I'd put up some pictures of the inside of our house. The top photo is taken from the kitchen looking through the dining room into the rumpus room (that's my lovely sister sitting on the floor in there!!). 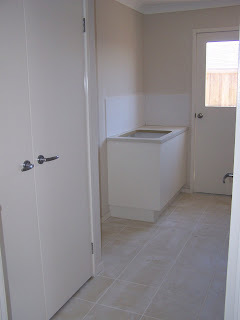 The next photo is the laundry and the last one, fairly obviously, is the kitchen. It's soooooo close to being finished! 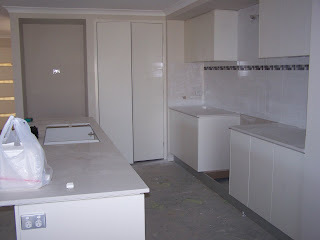 The ducted heating went in last week, as well as the tiling, so now all we're waiting on are the door handles for the kitchen cupboards, and the plumber's jobs (toilets, taps, basins and hot water connection). We're getting very impatient, and can't wait to move in!!! Nardi left a lovely message for me in my comments section, so here goes with the 7 random bits of info about me!!! 1. I got married when I was 19. 2. 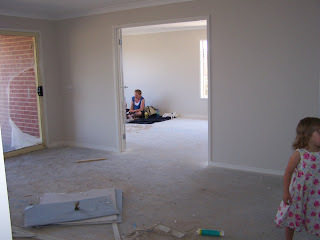 I have moved house 13 times (almost 14) in 10 1/2 years of marriage, having NEVER moved house before then!! 3. I am married to Nardi's DH's twin brother! 4. I FINALLY found a good hairdresser yesterday who can cut my hair so it sits properly!! YAY!! 6. 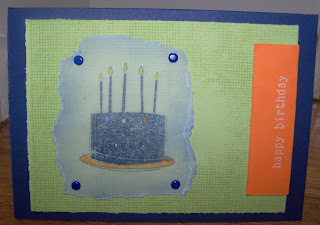 I had never made a card (well, not a nice stamped one) before I signed up to be a Stampin' Up demonstrator!!! 7. I can play the piano and clarinet and love to sing!! Ok - so now I"m going to tag 7 other people. This message has taken me ages to write cause I got sidetracked chatting to my best friend in Brisbane for about an hour (I know - so unusual for me - NOT!!!). So now, here I go to let my lovely friends know they've been tagged!! Having the car serviced is sometimes fun!! Today I had to hang around while my car was being serviced, so I decided to go to the library and catch up on some stamping!! I'm really happy with both cards. This first one is one I made to use a stamp set I hadn't used before. This stamp set was one we were sent for FREE from Stampin' Up just for being demonstrators - it's called Time Well Spent and will be a hostess one in our new catalogue that's coming out in April! How cool is that!! The other one is for my nephew's birthday (and really needed to be sent last week to make it in time for his birthday!!) Oh well, better late than never!! Hope you like them!! 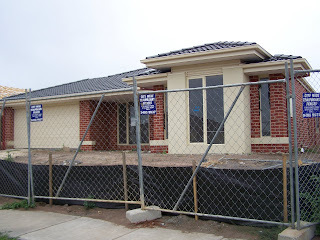 I thought I'd better share one of the most exciting things in my life right now - OUR NEW HOUSE!!! It is soooo close to being finished with just the tiling, and bits and pieces like door handles and light fittings to go. We are getting very impatient, even though the builders have done a fantastic job - the slab was only laid at the end of October!!! So here's a photo taken this morning. This is one of my favourite cards ever! I had just bought my first jar of Dazzling Diamonds (one of my fave Stampin' Up products) and was experimenting with versamark and glossy white cardstock - and this is what I came up with! I have used the Scribble This set from our Spring mini catalogue, with the Scribble This wheel as the background. I have wheeled the background on both the Pink Passion and Glossy White in versamark. I have then used our Heat and Stick powder over the versamark, heated it, then added Dazzling Diamonds. The flower is cut out and layered using Dimensionals. Hi! 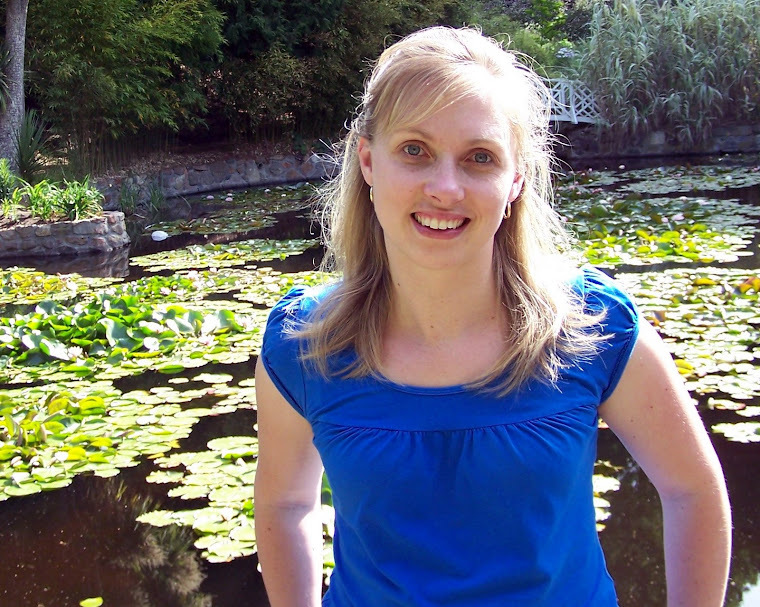 My name is Bronwyn and I am an Independent Stampin' Up! demonstrator in Melbourne, Australia. I have four gorgeous children and a wonderful husband! I have created this blog to showcase my card creations. Enjoy! Stampin' Up offers you the opportunity of a fun and flexible business you can build to suit your needs. Hobby demonstrator: Join to receive a minimum 20% discount on your stamping and scrapbooking supplies - occasionally sell the products to family and friends. Short term demonstrator: Conduct workshops and sell the Stampin' Up products for a short time to earn some extra money. 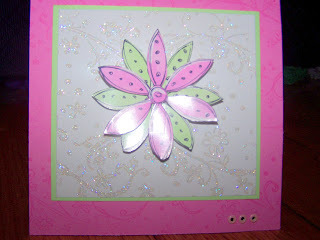 Career demonstrator: Builds a successful Stampin Up business, conducting workshops and classes. Works hard at her business.